Vintage Mother Of Pearl Cigarette Holder. Condition is Used. Dispatched with Royal Mail 2nd Class. I found it in a box belonging to my Mum, it hasn't been out of its velvet bag for at least 50 years, it beautiful condition. MADE IN ENGLAND. IN EXCELLENT CONDITION. THE MOTHER OF PEARL ARE ALL COMPLETE. THE MIRROR IS INTACT AND CLEAR. THE HINGES ARE VER Y GOOD. THE CATCH IS IN VERY GOOD WORKING ORDER AND IT CLOSES TIGHTLY AND SECURELY. Faux Mother of Pearl Design. In great condition. (MADE BY RONSON CIRCA 1950'S AS WE UNDERSTAND. 'CIGARETTE CASE'. WE HAVE TRIED TO BE AS ACCURATE AS POSSIBLE. THE ITEM DISPLAYED WILL BE THE EXACT ONE YOU RECEIVE. N.B. ALL IMAGES EXCEPT THAT OF THE PRODUCT) ARE FOR REFERENCE ONLY. Cigarettes Box Storage Case Box Tobacco 100s Cigar Container Holder Mother of Pearl. It holds about 16 to 18 Cigarettes depending on thickness of Cigarettes suitable for ID cards, credit cards, gift cards. It holds about 16 to 18 Cigarettes depending on thickness of Cigarettes suitable for ID cards, credit cards, gift cards. Unique mother of pearl design, Beautiful embossed pattern on the backside and inside surface. Incredible Case ! 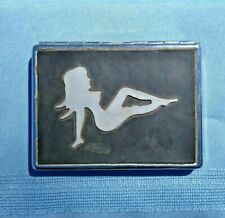 Fantastic mother of pearl LUCKY STRIKE cigarette case, this was brought back by a US soldier. Item is definetly old & of the period, superbly made & fantastic mother of pearl designs. "FASHIONED ON FIFTH AVENUE NEW YORK". MOTHER OF PEARL ACRYLIC & BRASS STARBURST BAND COVER. SNAP CLOSURE. BACK OF CASE SHOWS DISCOLORATION & WEAR. 4" long and in excellent used condition. In original case. COLLECTIBLE WOODEN CIGARETTES. THIS CASE IS MADE FOR SMALL CIGARETTES 71MM. WITH MOTHER OF PEARL TREE WITH TWO BIRDS ON THE FRONT SIDE. MADE IN CHINA OR KOREA. IT IS IN A VERY GOOD CONDITION AND LESS USED. Handmade Beech Wood Cigarettes Box Inlaid Mother of Pearl. Egyptian Beech WoodCigarettes Box Inlaid Australian & New Zealand Mother of Pearl. All The Inlaid Work Is Done In Our Factories in Cairo, Egypt. The overall size is 9" across by 2" tall with a lovely mother of pearl inlay on the top. The inside has a brass ashtray and storage as well. The only exception is with the country of Italy. If the item is new - it may be covered under the manufactures warranty. Respect Educate Advocate Love. An Estate Item. Unique Mother of Pearl Design. Beautiful embossed pattern on the backside and inside surface. Size: 4"W x 2.7"D x 0.6"H (10.2 x 6.8 x 1.5cm). A pair of phoenixes (bonghwang) with fully-opened wings and tail face each other embracing traditional Yin Yang symbol. Unique Mother of Pearl Design. Beautiful embossed pattern on the backside and inside surface. Unique Mother of Pearl Design. Beautiful embossed pattern on the backside and inside surface. One of the sagunja ("four noble beings") motifs loved by Korean artists, maehwa refers to the Korean plum blossom that has long been the herald of spring. Unique Mother of Pearl Design. Beautiful embossed pattern on the backside and inside surface.